Fixed Windows version not starting when launched outside game's directory. Completely reworked Winnitron arcade mode launch logic. Updated packages are available for download on Itch.io page and the official game page has been updated. It's a similar to the magnetic cannon, but with lower rate of fire and projectiles that steer away from friendly ships and towards enemies. One problem with the mobile controller apps have been that they do not work in all Wi-Fi setups. Many (especially public) Wi-Fi networks seem to block UDP multicast which prevents the app from finding any games. I haven't been able to fix this so that it would work everywhere, so I've added manual connection as a backup. Now the game shows the listening IP address when a match starts. Updated mobile controller apps allows you to manually enter this address for cases where game listing does not show any games. This update also adds a "Winnitron compatibility mode". This mode allows Hyper Ultra Astronautics to run in Winnitron arcade cabinets. I will later upload the game to Winnitron network. Fixed fast moving teletorpedos occasionally colliding and exploding prematurely. Fixed teletorpedos becoming indestructible after their teleportation time runs out. Added "resume" option in main menu and removed menu toggling with ESC. Added command line option to force full-screen mode with current desktop resolution. Documented all command line options in readme.txt. Removed "slide prevention" setting from menu. Added launch script for Winnitron arcade machines. Moved controller app QR codes from settings menu to controller help overlay. Increased weapon flash light ranges on most of the weapons. Fixed bug causing wrong weapon flash color on some weapons. Changed to a more low-poly style bullet shapes. Added create-menu-shortcut.sh/vbs scripts for setting up menu shortcuts. Increased arena light intensities slightly. Show listening IP address for remote controllers at match start. Updated packages are available for download on Itch.io page and the official game page has been updated. Mobile controller application update is waiting for approval on GooglePlay. This is a maintenance update to Lockdown Protocol, the first one in 2.5 years! I didn't realize it's been that long. The most important reason for this update was that the Linux version is no longer working out-of-the box in many of the modern distributions due to removal of required old libpng library version. Also, a lot of bug fixes and improvements have been made to my "engine code" over the years while developing Hyper Ultra Astronautics. I decided to drop the built-in level sharing mechanism, because it was a maintenance nightmare and due to the fact that during last three years it has been used only three times in total. I will no longer build a 32-bit Linux version, because practically no-one downloads that anymore. Dropped Direct3D support (was never used by default anyway). Fixed some compatibility issues on Linux (no more libpng dependency). Added monitor selection in system menu. Added monitor gamma adjustment in system menu. Added V-sync interval setting to system menu. Prevented "Automatic lockdown.." voice announcement from playing in editor preview mode. Rewrote collision sound volume calculation. Fixed random crashes at exit. Added itch.io manifest files and cleaned up remaining references to Desura. Switched to use SDL2 game controller mappings for much better gamepad support. Fixed crash when starting level editor repeatedly. There has been a lot of code changes, so I would be surprised if there are no new bugs. If you encounter any problems, please report them and I'll sort them out. Added support for mobile controller events (e.g. flash effect on damage). The Android app has already been updated. Ignore ship steering from remote controllers when both left and right buttons are pressed. 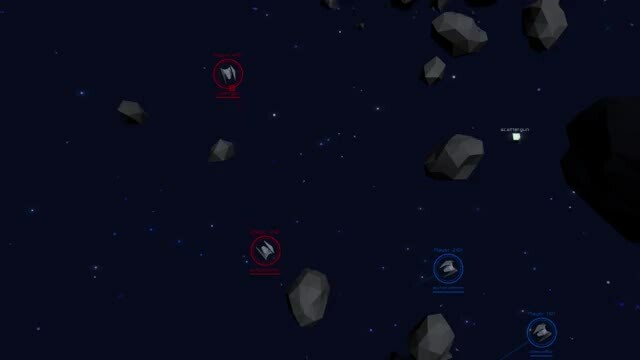 Adjusted background asteroid color slightly to better blend into the background. The biggest feature still missing is the iOS version of the controller app. The app is made using Godot engine, so porting should not be an issue. The problem is that I don't have Apple developer license or any Apple hardware to build and test on. I have released the source code and I'm hoping that I can find someone else to publish it on iOS. As for the pricing, I have finally made some decisions. The game will be available at "pay what you want" price on Itch.io with no minimum payment. I will possibly later add some additional weapons/items that are only available above certain price point, but the base game will remain freely available. If the game later on ends up in other stores (for example Steam), I will likely have to set a fixed price. Because the EU General Data Protection Regulation (GDPR) is coming into effect next month, I have been trying to make sure my website and game services are compliant. As neither the website nor the services require registration or login, there wasn't much personal data being collected to begin with. I have always been wary of storing any sensitive data so naturally my aim is to not collect any personal data that would require user consent according to GDPR. Nearly all services running on the host log IP addresses and those will be considered personal data. I can't disable logging completely as that information is crucial for detecting and preventing network problems, hack attempts, service misuse, etc. Instead, I set up all logs containing IP addresses to be deleted after 12 weeks. Similarly, all IP addresses are purged from game service databases like high score tables. This limited IP address storage should fall within "legitimate interest". Google Analytics was completely removed as I haven't been using it that much anyway. I might reconsider this later if I can find a way to do that without collecting any personal data and thus not having to ask for user consent. ShareThis social media sharing widget was replaced by direct share links to social media sites. Gfycat video player widget was replaced by HTML5 video player. Youtube embeds were set to use privacy-enhanced mode that should not store any cookies on load. Itch.io widget was replaced by a link to downloads. According to multiple online cookie checkers, no tracking cookies are created. Playing embedded videos will still access external resources and potentially allow third party servers to store data provided by the browser. I don't know how I could prevent this unless I self-host everything. Edit 2018-05-22: It turned out that no-cookie version of Youtube embeds may still track users even before playing the video, so I changed the code so that the actual Youtube embed is only loaded once user clicks on the preview image to play the video. This also made pages load a bit faster. 2012-12-31 How to improve The Platform Shooter? 2011-09-20 I can hear music!